RFID for smooth material flow in the supply chain | deister electronic UK Ltd.
RFID media are built into or onto work piece carriers, for example, and are generally used for production control. The latest approaches use RFID in the area of production logistics, where e-kanban ensures the availability of replacement parts, or components already tagged by the supplier are verified at the point of installation. UHF RFID transponders (‘electronic labels’) detect goods of all kinds within the logistic chain. They identify and store production data and are used to trace the paths of individual goods. Transponders have become an essential control element in logistic chains and production processes. The textile and elastic UHF RFID transponder from the RFID company deister electronic can be directly integrated into flexible materials, quickly and accurately providing the information required during the production process. The experts of deister electronic also developed the new compact industrial readers TSU100 and TSU200 for short and mid-range applications in logistics, transport and industry. The robust IP67 housing protects the antenna against rugged environment and provides perfect reading results (simplifying installation). The robust TSU 200 UHF RFID reader was developed for applications in both, industry and in the areas of parking management and access control. The device is used for managed processes in the automobile industry and in automation technology. Production parts are recorded in seconds by the UHF reader. High temperatures, dust, dirt, oil, grease, and water are just some of the environmental influences in the industrial environment that the new TSU 200 from deister electronic can withstand. A small, flat, and compact IP67 aluminum ABS housing (dimensions: 175 x 200 x 60 mm) protects the built-in antenna and electronics. The compact TSU 200 UFH write/read head supports the ISO 18000-6C and EPCglobal GEN 2 standards. To optimize material movements, the automation of all processes can be controlled with solutions based on RFID technology. For example, automatic connection of machine routes to a high shelf warehouse system and automatic truck loading from the warehouse system are possible with UHF RFID solutions. RFID transponders are extremely robust in comparison with barcodes. They can be hidden in loading accessories and are suitable for both storage and removal material flows. Suppliers also use RFID technology. Stock is reduced and the parts needed are available “just in time”. Production control software is used to ensure perfect control and logging of coordination between individual locations and suppliers. That lets materials flow innovatively and cost-effectively. The commissioning-friendliness of the devices (readers, gate, transponders) and the service of deister electronic are convincing. With 868 MHz technology, multiple workpieces, pallets, and the like can be identified and recorded simultaneously in bulk. The RFID specialists at deister electronic offer custom optimization analysis and applications that can even be integrated into existing systems. RFID has become a daily topic in all sorts of media and the contactless data transmission can’t be stopped when talking about smart ident technology. There is plenty of optimizing potential in this area of logistics. While at first the automatic identification of inbound or outbound goods using RFID portal solutions has been in the center of efforts now the intra-logistics is moving more and more into focus. The latest approaches aim at automatic identification of in-house storage location via RFID. 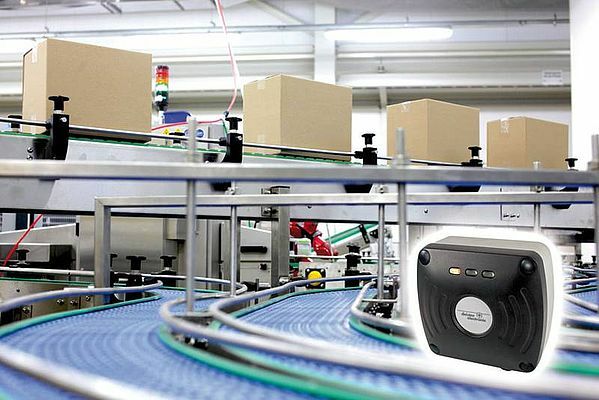 Part and parcel of this solution is the UHF-RFID reader UDL 100 from deister electronic which has been specially developed for use on forklifts. Its robust and compact design with integrated antenna makes the UDL 100 ideal for safe operations even under tough environmental conditions in warehouse logistics. Mounted between the forks on the fork carrier it identifies the storage location reliably up to the highest level. Processes can be optimized by using RFID. It results to costs savings, the reduction of deliveries and searching times by commissioning. Due to the highly detailed recording, the billing of additional services is improving and ensuring the completeness of the delivery and return. The improved timeliness and preventive maintenance and inspection of rental items enhances the quality of the service. The detection reliability of RFID labels is higher than barcode labels.